Mamarazzi went shopping at Ikano while I stayed in the car with Papa. After she finished her shopping, she pop-by IKEA and bought some food to reward us. Mmmm....what is that delicious looking thing that Mamarazzi bought. 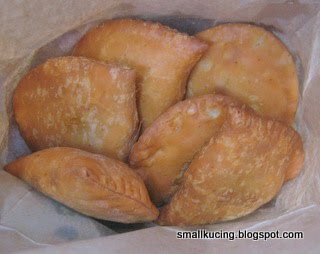 Curry Puff? How much one? Rm1/pc and if buy 6 pieces get 50sen discount. Haiyo...Mamarazzi really kiasu ya. 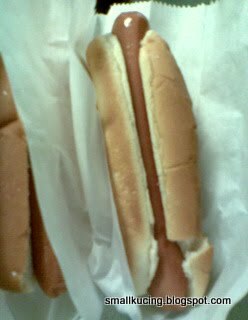 What else" Two hotdogs. One for me and one for Papa. Got generous heaping of onions and stuffs from the counter. Can put as much as you want. Apa lagi..Mamarazzi add till the hotdogs are like little mountain la. See! she put so much. Errr..can finish or not ah so much? i nak!!! the other day no chance to buy the curry puffs.. came down forgotten all.. maybe also full la that day and too excited to buy.. hahaha.. next round, i will go.. we meet again there OK? this is a must if we go IKEA hoh... hahhaa.. I also bought a dozen back that day..
i love it too!!!! yummy!! 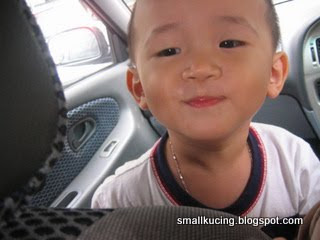 Little Joshua can eat the curry puff?? Not bad... I myself find it quite hot.. Hahahahaha!!!! I love your face lah! 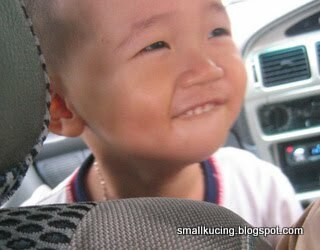 Want to cubit, so cute!!! I heard so much about the meatballs at IKEA...but so far nobody has taken me there to try. So kesian lah me...no friends. Sobs!!! love the food at ikea. make me feel like going there after my dental appointment tomorrow. but i think i cannot make it. because after dental sure 'kong kong' in the head wan, haha. Yes! I love the curry puffs too. Sometimes I take two puffs and free coffee for lunch. Eat less, weigh less, spend less. We love the curry puffs too!! But we can't buy it everytime we go to Ikea cos we go there too often haha. How you tapau the hotdog ar? How come the sauce and condiments all still looked so nice instead of all mashed up? I only ate their curry puffs once or twice only coz I hate the long queue. Wow...eat in the car some more. Gwen used to eat biscuits in the car and roaches start appearing after a while. Must make sure no crumbs are left in the car lor. surprisingly though the queue very long but the service very fast. oh..havent try the hotdog before..somemore can kah liu? Good..try next time. Wah, add so much stuff.....become Mountain dog already! LOL! yep, i love the hot dogs too, but never try the curry puff yet though. Is it nice? @smallkucing... *HORRIFIED* NOOOOOOOO~ Dun put fried beehoon.... it'll be a torture... sobsosb... u feed me beehoon, can, but dun put it up! Sobsosbsosb.... scary man! @Cikgu... dun worry, ur not alone...I oso never go IKEA before. You can kawan wif me. Sobsob... nobody bring me there... I oso very chammmm... summor elive in KL! Sobsobsob! Somehow, when I'm at IKEA, I never got a chance to eat the karipap which people say is GOOD. And they've hotdogs too? DROOL and double drool! Oh....I love Ikea Hotdog...super yummy. Only when I got chance to go KL or Spore,then I can eat again. 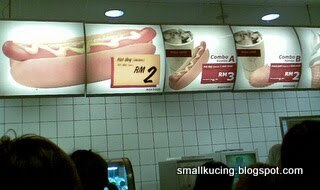 Really wish can fly to KL or Spore now to have a bite of the Ikea hotdog...really craving for it. much nicer than many food court food. wait till i post the taiwan hot dog.. When will IKEA open a branch over here in Sibu? I am waiting! 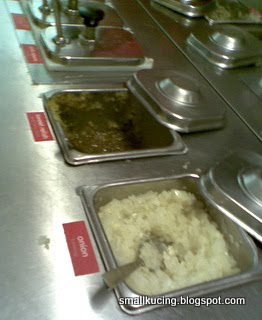 Ya...can take as much of the kind of topping that u want..that is the best part. 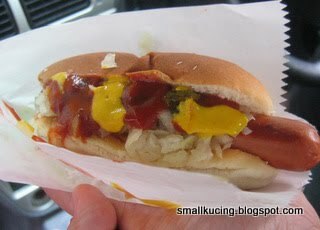 Kathy, thought Ikea stops selling this hot dog already cause we couldn't get it the other day we went. Our favorite hot dog. The curry puff is nice.